Former Steeelers running back, Jerome Bettis, aka: The Bus,’ was the keynote speaker at Ben R. Giambrone/Compeer Rochester Sports Luncheon held on Wednesday, Nov. 18, at the Rochester Riverside Convention Center. Compeer Rochester, which is celebrating 40 years, provides mental wellness services to at-risk adults, veterans and youth. Its model for success is supportive one-to-one relationships. 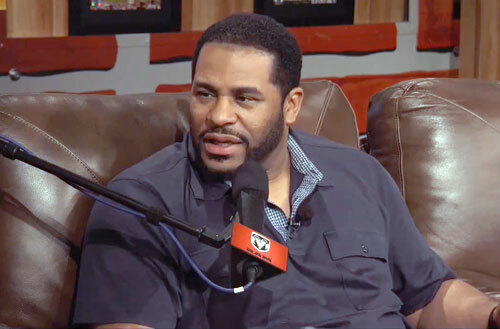 Photo shows Jerome Bettis speaking with Dan Patrick in a February 1, 2013 interview. Bettis, who spent thirteen years in the NFL, has 13,662 rushing yards, six Pro Bowls and a Super Bowl ring added to his list of achievments. The NFL legend could have spent his time speaking about his career, but instead delivered a simple, powerful 25-minute message that had just as much impact as his rushing. The Super Bowl Champ told the audience to give back. Be a mentor to someone. Be a friend. Make a difference. The six-time Pro Bowler, who joined Terry Bradshaw, Lynn Swann and Rocky Bleier among the Steelers greats to speak at the Compeer lunch, knows all about the power of such a thing. Sports Speakers 360 is a booking agent for motivational sports speakers. If you would like to book athletes like Jerome Bettis for a speaking engagement, autograph signing, guest appearance, product endorsement, charity fundraiser or corporate event, contact our booking agent for appearance and speaker fees or call 1.855.303.5450.